The Islamic State, which continues to win military victories against Iraqi forces, took headlines on another front on Friday. The jihadists purportedly issued a directive, in the name of leader Abu Bakr al-Baghdadi, which gave residents of Mosul four options by Saturday at noon: convert to Islam, pay tax, face execution, or leave the city, captured by insurgents last month. The document, issued after Friday prayers, said that Christian leaders failed to attend a meeting called by the Islamic State to discuss the terms. Mosul’s Christian community is estimated at 3,000, but many are believed to have fled amid the 1/3 of the population who left after last month’s takeover by insurgents. Claims are circulating on social media that the Islamic State have confiscated properties of those who are no longer in Mosul. Fleeing families said their money and jewelry was seized at insurgent checkpoints. Earlier this month, al-Baghdadi gave a Friday Prayer sermon in Mosul which declared a Caliphate across Islamic State-held areas of Iraq and Syria and proclaimed himself as “Caliph Ibrahim”. Kurdish Prime Minister Nechirvan Barzani has said that the number of displaced Iraqis hosted by Kurdistan has surpassed its capabilities, and has called for the international community to help. He said there are more than 1 million displaced people in Kurdistan — 750,000 Iraqis who have fled the fighting in northern Iraq and more than 250,000 Syrian Kurds. 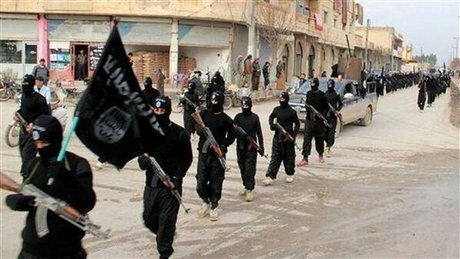 Fighting between insurgents, in particular the jihadist Islamic Front, and Iraqi forces was reported on a number of fronts on Friday. Having repelled the attempt by Iraqi troops and militias to retake Tikrit in northern Iraq, inflicting significant casualties, insurgents infiltrated Camp Speicher — formerly one of the largest US bases in Iraq — and destroyed helicopters. The Islamic State launched another attack on Dhuluiya, northwest of Baghdad, having surrounded the town for weeks. Fighting was also reported northeast of Baghdad near Muqdadiyeh. Clashes south of Baghdad, near Babil, killed 15 Islamic Front members and five fighters with Iraqi militias. An Islamic State suicide bomb killed six Federal police and wounded three others near Balad airbase, northwest of Baghdad.